When I was a kid, I lived far enough out in the country that we didn’t get trick-or-treaters. Ever. Considering our nearest neighbor was over a quarter of a mile away and down a steep hill, it was never a surprise, but still, I always wondered what it would be like to be one of the houses everyone went to on Halloween. Nowadays, I live in a busy neighborhood and get to experience this every year — which means that, every year, I buy candy to hand out. (Apparently, though, I don’t hand out the most common candy in my state — who knew?) 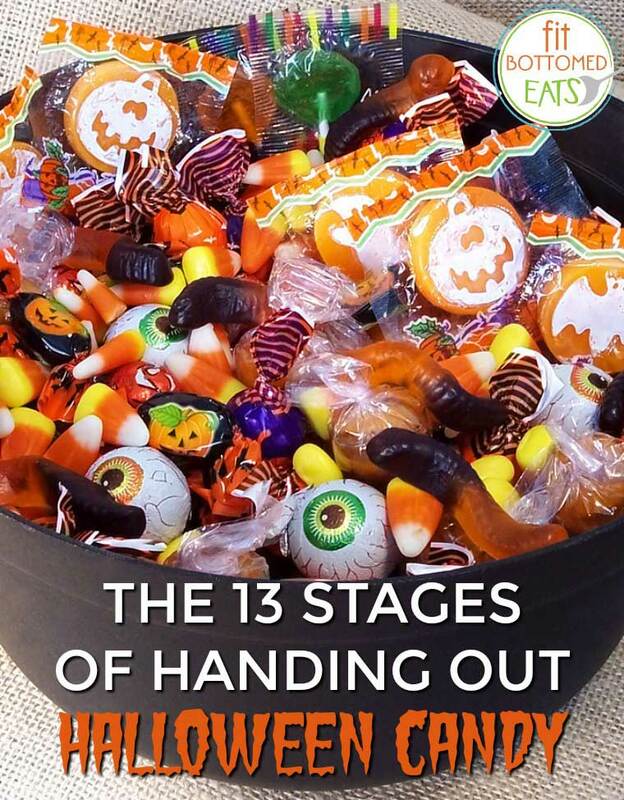 I’ve noticed that we go through several stages with that candy, and I’m betting my home isn’t the only one to experience this. Oh, it’s October! I guess I should start looking for deals on candy. Or maybe I’ll buy something delicious but healthier. Or I could give out toys! I have loads of time to figure this out — no rush. OMG, Halloween is right around the corner. I need to buy candy — any candy. Now! I have such amazing willpower. All this candy in the house, and I’m not even opening a bag. I am an oak. The kids will be here at any time! I’d better open a bag. And maybe I should taste just one. One of each, I mean. Did I try that one? I’d better make sure. Here, take the candy. Take all the candy. Save me from myself. Wait, how did we end up with leftover candy? Ugh, I never want to see it again. YES! We still have candy! No, seriously, never want to see this stuff again. I’m a new person. I am so excited to get back to snacking on nourishing foods. Give me all the veggies! Aww. I miss having candy around. Stage 2 here too. Tomorrow is buy the candy day. Skittles, really?